Horseradish is a hardy perennial that forms a rosette of long leaves. The 30 or more strains in cultivation include Bohemian, Swiss and Sass, and almost all of them are sterile. Below ground, the plant forms a taproot that expands in diameter in the second and third year. This plant requires a sunny position and a well dug soil enriched with rotted compost. In spring plant pencil thin sections of lateral roots horizontally, or up to an angle of 30° from the horizontal. Cover with soil and firm down. Do not let the plant dry out otherwise the roots will become bitter. Dig up horseradish roots and use them fresh at any time in the second and third year; they are at their peak in flavour after the first frost. Store clean roots in sealed p0lastic bags in the fridge for up to 2 months. 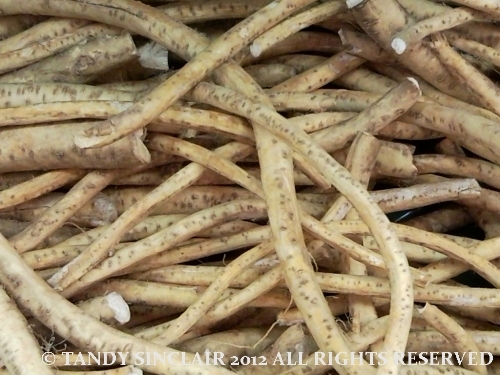 Young horseradish leaves can be eaten as a vegetable, but the root is the part most often used. Peel and grate it as needed, as it loses its pungency soon after grating or when heated. To make a simple condiment mix 250mls grated horseradish, 125mls white wine vinegar and 1/4 teaspoon salt. Store in a lidded jar in the fridge. Use this with beef, fresh or smoked fish. Great post on horseradish, I love it and I grow some in a pot (watch out when planting it out in your garden, it will spread like hell). A variation would be to grate some apple into your horseradish with fresh cream, heavenly! I LOVE horseradish. Didn’t know you could eat the greens–I want to try them now! Mmm I love the spiciness of horseradish. It’s a great way to liven up many dishes! I could eat it with anything! I love a bit of horseradish with my beef, but not so strong that it clears my sinuses. 😉 The bottled ones do tend to vary a lot. I love seeing actual horseradish. By the time I see it it’s in jars! we get it fresh here for a very short time each year! Like Roger, I like my horseradish sauce with cream. It´s such a great plant but I´ve never seen it fresh here so my mum males me deliveries when she visits! I really enjoy horseradish sauce made from cream and grated fresh horseradish.